In the heart of California, in the midst of rolling hills, there is a very special place known as PAWS to us humans, and considered heaven-on-earth by dozens of elephants, tigers, and other big cats. Started by Pat Derby, former Hollywood animal trainer turned animal advocate, the Performing Animal Welfare Society (PAWS) is a refuge for animals who have long suffered in captivity. I am a huge admirer of PAWS’ work, which is now carried on after Pat’s passing by her partner Ed Stewart and a dedicated team of caregivers and scientists. Not only do they care for these special individuals, but they advocate for important legislation to improve the plight of wild animals here in the States. Several years ago I was able to visit the sanctuary grounds and meet the residents, including Toka, Thika, and Iringa, the last three surviving elephants at the Toronto Zoo in Canada. Ripped from the African wilderness and their families, Toka and Iringa were shipped to a Canadian zoo where they would later welcome Tika, who was born on-site, to their circle. Together they endured their captivity, a harsh enclosure and climate, and garnered the sympathies and energies of animal charities, advocates and celebrity Bob Barker. This animal-loving triumvirate brought about the retirement of these pachyderms and orchestrated the 2,500 mile trip so that these elephants could have their very own 80-acres of freedom at PAWS. This lifelong journey to sanctuary was no small feat, and the majority of the book’s pages focus on the last leg of the journey from the zoo to California: the fabrication of special transport units, the Canadian-US border crossing, and overcoming mountainous, snowy terrain. Subdued oil paintings by Brian Deines based on actual footage from the trip make this a calm, easy-to-follow and hopeful storyline. And this wouldn’t be a Laidlaw title unless their was some science, which comes in the form of an index, photographs and additional information at the end of the book. So much of what PAWS does goes without the recognition it deserves. 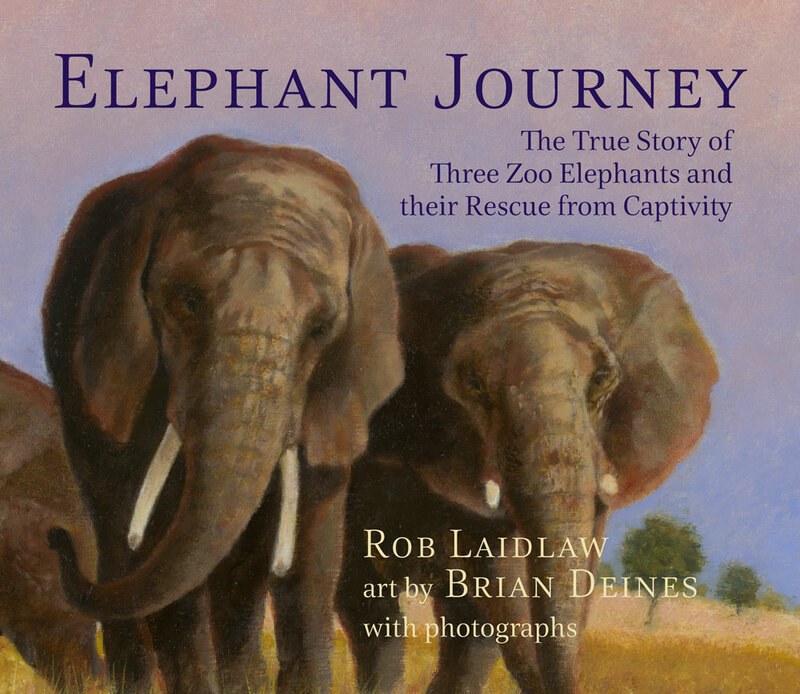 This 40-page book does a beautiful job of telling a powerful story that demonstrates why sanctuaries, animal activists, and nonprofits are so important: because they help real animals who have endured so much, like Toka, Thika, and Iringa, and are making great strides towards creating a world free from harm, free of captivity. Recommended. Ages 6 to 9. I must get a copy of this book. Not only am I a fan of Brian Deines’ work as an artist, I am also interested in the cause of PAWS. I would like more information as to where the facility is in California. I don’t have a website. The PAWS location is just outside of Sacramento, CA – 1065 Pool Station Rd, San Andreas, CA 95249. They’re open to the public just a few times each year.